With the onset of the new year, we are delighted to announce some fantastic new resources from the CJPE. 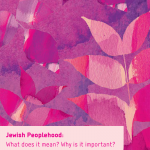 First, check out www.jpeoplehood.org – the new website of the Center for Jewish Peoplehood Education. Re-organized, with a new look and now fully accessible on mobile devices, the CJPE website is here to serve you better. It is clearer and more user-friendly than its predecessor, offering clear navigation and easy ways to access all the resources of the CJPE. The latest version of the Peoplehood Papers is out! Volume 13 is a stimulating collection of short essays on the key questions of Jewish Peoplehood; what it is, why it is important and what we can do to nurture it. The CJPE Digital Library is re-organized and is now clearly catalogued so you can find lots and lots of great reading materials on topics related to Jewish Peoplehood. The Jewish Education Toolkit is expanded to include lots of new content and resources on the theme of Judaism as a Civilization, as well as new media resources and expanded activities. As we reflect on the past and the future, I find myself turning to the inspiring words of Shaul Tshernikovksy, from his poem “Laugh, Laugh!”. He encourages us to hope, to laugh and to aspire to peace. May his words be fulfilled! We at the CJPE wish you and your families and communities a Shana Tova U’Metukah – a sweet and happy year. We welcome your feedback on all our new materials, and are here to work with you on the issues related to Jewish Peoplehood, wherever you are. We look forward to hearing from you in the coming year! Thanks for the ideas you have shared here. Something imrpotant I would like to state is that computer memory requirements generally rise along with other advances in the technological innovation. For instance, if new generations of processor chips are introduced to the market, there is usually a related increase in the scale preferences of both the computer system memory in addition to hard drive space. This is because the software program operated by means of these processors will inevitably boost in power to benefit from the new technological know-how.